The article examines the current state and investment of supplying the agriculture with the main types of agricultural machinery. The availability and capacity of combine harvesters and tractors of all brands at agricultural enterprises and households has been analyzed. The issues of agricultural machinery renovation, including the expense of imports, are considered. In order to justify the most effective external funding the investments in agricultural machinery, a comparative analysis of financial leasing conditions and bank lending for purchasing a new tractor and a combine harvester. The prospects for further research have identified the justification for the rational composition and structure of the material and technical basis for the intensification of agriculture in the region. Promising energy technology means for controlled traffic farming are wide span tractor (vehicles). The effectiveness of the practical use of wide span tractor (vehicles) depends on a sound scientific base or theoretical frameworks, concerning the study of their technological properties. The article presents the theoretical basis of the dynamics of plane-parallel movement wide span tractor (vehicles) in the horizontal and vertical plane as well as its cornering. Developed the theory of plane-parallel movement wide span tractor (vehicle) allows for the justification of new schemes, design parameters and operating modes with acceptable controllability and stability of motion in the horizontal plane. Ride wide span tractor (vehicles), as a dynamical system, moving through the traces of permanent tramlines significantly depends on the characteristics of the irregularities of the longitudinal profile. The desired character of the internal structure of the longitudinal profile laid tramlines is almost possible to obtain the appropriate technology for its formation. Quality testing of dynamic system input perturbations, which are irregularities of the longitudinal profile permanent tramlines and the unevenness of the traction resistance of the soil, depends on the scheme and the constructive and other settings wide span tractor (vehicles). A significant impact on the smoothness of the latter renders the rigidity of the tire support wheels, the magnitude of which can be influenced, within certain limits, by changing the air pressure in them. Improve driving dynamics the technological part of the wide span tractor (vehicles) is observed by increasing the rigidity of the tire its supporting wheels and operating mass. The offered new scheme of the turn of a wide span tractor (vehicle) for controlled traffic farming on the turning strip by turning the undercarriage, using the steerable wheels from its one board around the turning centre arranged in the centre of the space between the wheels from the other board, allows shifting of the tractor, simultaneously with the turn, to the next operating position with better kinematic parameters. In addition to it, the improvement of the turnability characteristics is achieved at such a design embodiment of the wide span tractor (vehicle) when the relation of its wheelbase to the width of the wheeltrack is as small as possible. 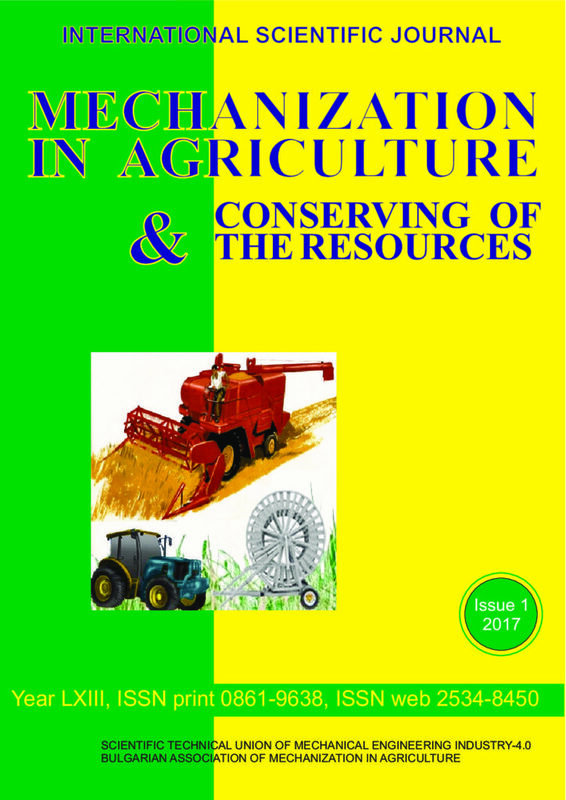 Reveals the scientific and methodological principles of determining the needs of farmers in the technical means to perform mechanized processes of agriculture. The parameters of technological systems in different technologies in crop production and the volume of work that match agricultural requirements the quality and timeliness of work. Researchs of the influence of the soil particles were perfomed on the powder loamy soil to powder clay texture. Standard and welded ploughshares were tested. The standard ploughshares are made of steel 50Mn7. The welded ploughshares are made by applying C-Cr-Co-Ni-Si additional material on the steel 50Mn7. The ploughshares are tested on the plough roller machine. Researches were perfomed in periods of 120, 240 and 360 hours of ploughing, or 60, 120 and 180 work hours of each ploughshare. After 180 hours of work at least average reduction of the ploughshares lenght was at welded ploughshares and it amounted to 8,27 % of the initial length. At the same time reduced the average length of the top of the ploughshares with standard ploughshares amounted to 19,65 % of the initial length. It was concluded that the application of welded ploughshares can contribute to increased of the productivity.